I was ten years and ten months old when I went on my first camping trip with the Boy Scouts. I remember being told that I wasn't really old enough yet, that I was supposed to be eleven; but I had learned that this wasn't strictly true, that according to the letter of the rules, you had to be eleven years old OR have completed the fifth grade, and since I had accomplished the latter, I knew they had to let me in. 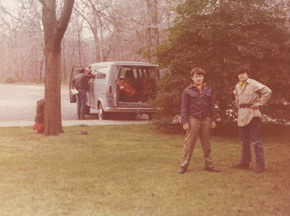 So, in the fall of 1974, I became a proud member of troop 728. At 5:30 on a Friday evening in late September, my dad dropped me off at the church where our troop held its meetings. We met there every Monday night, and it was also the departure point for camping trips. My dad is quite relentless about being on time, so naturally, I was one of the first to arrive. Not the very first, though. Peter was already there. He was a little older than me, but he too had just joined and this was also his first camping trip. Being in the same boat, as they say, we had been teamed up as tenting and cooking partners. 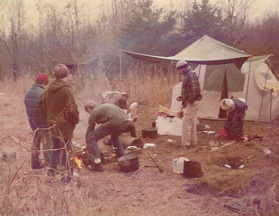 At the previous weekly meeting, with the help of the scoutmaster, we had worked out a schedule of meals and what food would be needed to cook each one. As I looked at him, I could read in his face the same thoughts that were also plaguing me: "Boy, I sure hope I didn't forget anything." "Hi," he replied. "Did you bring everything on the list?" The list was really two lists: a list of personal gear that every scout should have on a campout, and a specific Me-and-Peter list of what food items each of us was supposed to bring. "I think so," I said, looking nervously at my pack. It was jammed with stuff and seemed to weigh about 900 pounds, yet I couldn't help thinking I'd forgotten all kinds of crucial items. A few minutes passed in which we sat nervously on the ground, leaning against our backpacks. Neither of us spoke. Eventually the other scouts began to arrive. We had a good-sized troop, with twenty-five or thirty guys on the roster and fifteen or twenty who actually showed up for most of the meetings and campouts. Being the first trip of the year, almost twenty people turned out. Now, of those twenty, about half were thirteen or fourteen year old kids, true adolescents, with half-grown bodies and pimply faces, still interested in kid stuff but also starting to be interested in grown-up stuff, like cars and girls. Then there were three or four guys closer to my age, a year or two older perhaps but still small and weak and definitely boys, in both form and mentality. But the rest of the twenty fell into a very special category, one admired and envied by everyone in the other two categories. They were the Older Scouts. The older scouts were fifteen, sixteen, even seventeen years old. They were fully grown, and, while given over to horseplay and pranks, nevertheless possessed strictly grown-up interests. Far advanced over the adolescents, some of them actually drove cars and, in boasts at least, actually dated girls. Seven guys comprised the group which I refer to here as the older scouts: Donny, Bruce, David, Todd, Jim, Tim, and Chris. They were among the last to arrive, and did so all at once. They came in two cars, a large station wagon, and a big, gas-guzzling American car of the type that pretty much died out around 1973. Donny was driving the station wagon, and as they pulled into the parking lot, I heard his voice, booming across at us, "All right we're here now, let's get this show on the road!" But he wasn't shouting; Donny had his car wired for sound. He had a bunch of stereo equipment in the back of his car, including a big speaker and a microphone. He was speaking into the microphone, and Chris, who was riding in the passenger seat, held the speaker out of the window so that Donny's announcements could be heard far and wide. He parked, and we all clustered around the car. "Come on," said Donny, as he hopped out. "Let's go unpack the closet!" 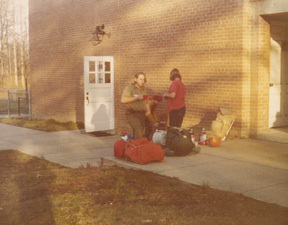 Donny was the Quartermaster, and was in charge of all of the troop-owned equipment, mostly tents and pots and pans, which was stored in a closet inside the church where our troop met. It was kept locked, but Donny had the key. So we went into the church. It was a huge church, with many floors and many hallways and many many rooms. It was one of the largest and most complex buildings I'd ever seen, and as we went down into the depths I realized for the first time just how labyrinthine it was. We had always met in a large meeting room up on one of the main floors, but the closet where the troop kept its stuff was down in the basement, and I'd never been there before. But the complexity of the church didn't bother Donny at all. He led the way with calm certainty. I later realized that he was familiar with the lower levels of the church not just because of numerous trips to the closet and back, but because the older guys had fully explored the labyrinth within the church. In the fullness of time, I too learned the ins and outs of the church's many mysterious hallways, but for the moment, it seemed overwhelming. When we got to the closet, Donny opened it up and began tossing out equipment. Peter and I were issued a tent, and told that if it got wet during the trip we'd have to take it home and let it dry and air it out before returning it. He made us sign a sheet of paper, next to the words "Tent Six." The older guys, meanwhile, were removing all sorts of equipment without such formalities, though Donny did seem in complete control, nodding his head with each removal and occasionally issuing instructions. By the time we got outside with our tent, we saw that the cars were all being loaded up, and in fact were becoming nearly full. So we crammed our packs and our newly acquired tent into niches here and there, and then searched out niches in which we could ride. Seats in the cars were all going fast. I ended up riding in the back of Donny's station wagon, cramped between backpacks. It was steerage class accommodations to be sure, but I didn't mind, because I would be riding in the company of some of the older scouts. The sun was racing towards the horizon as we finally got underway. Donny popped the car into gear and we lurched off. I was nestled in tightly among camping gear, and had to shift my position many times in order to get comfortable. And in spite of being cooped up this way for the entire drive, I still enjoyed it greatly. I sat listening to the older guys talk and laugh and joke, and though I was only minimally involved, I still somehow felt that I was a part of it. The older guys had an odd attitude towards myself and the other younger members of the troop. They seemed very contradictory. Sometimes they would act very warm and friendly, eager to lend a hand, ready to show us how to do something, and allowing us to join fully in the various activities going on. But at other times, they had no patience with us at all. They would ignore us, shun us, tell us to get lost, and even make fun of us. For the most part though, I didn't notice this dichotomy on the trip to Henlopen. Perhaps because it was my very first trip, or perhaps because they took a genuine liking to me, the older guys treated me very well. Donny I recall was particularly friendly. As he steered his auto down the highway, he suddenly said to his compatriots, "Hey, how's the Android doing? Is he squashed yet?" I heard this question and squeaked "No, I'm fine!" and this made everyone else laugh. But Donny shouted back, "Good, but let me know if you get too uncomfortable." The nickname "Android", which Donny had apparently made up on the spot, actually stuck for awhile. Throughout the trip, and for years afterward, Donny called me Android. I liked the nickname very much, and wished for it to catch on in wider circles, but it never really did. The car bumped along the highway. As the gathering twilight slipped the evening into complete darkness, Todd began to lobby for a food stop. At last, when he saw a Burger King on the horizon, he persuaded Donny to stop. Donny wheeled the car into the lot and we all piled out. I stretched, and my joints creaked and my back hurt from having a tent pole sticking into it, but I said nothing about my soreness and tried to act cool. When asked if I was sure riding back there was OK I insisted that it was, but inwardly I was thankful for the break and was desperately hoping that it wasn't much farther to Henlopen. We strolled into Burger King and I looked up at the menu and gasped. I suddenly realized that I didn't have any money, and that Dad wasn't here to pay for my food as he usually was. I could have brought some money if I'd thought of it, but it wasn't on The List, and besides, it didn't occur to me that I would need money on a camping trip. David was towering over me and heard my gasp. He bent down and whispered, "What's a matter, no cash?" I nodded. David shoved a couple of ones into my hand and said, "Pay me back someday, if you get a chance." We got the food to go, and quite soon we were barreling down the highway again, munching burgers and fries and drinking milk shakes. I became very tired after eating, and somehow, even while crammed in among the equipment, I managed to go to sleep. It was almost midnight when we finally arrived at Henlopen State Park. I can remember waking up and wondering where I was. I heard Donny's voice, shouting "Come on, Android, wake up!" and this jarred me into the present. I climbed out of my niche in the back, and stood, sore and aching, on the edge of a sand dune. The moon was out, and nearly full, and I could see other dunes rising in the distance, and beyond them on all sides, groves of pine trees. Before me, Boy Scouts were getting out of cars and unloading equipment into piles on the sand. They seemed ghostly and indistinct in the moonlight. The air was cool, but a warm breeze blew across the sand and through my hair. Clouds rolled across the face of the moon, and it became very dark. I looked in every direction and did not see the ocean. "Where's the ocean?" I thought. We'd been told that this was a trip down to the beach, that we'd be able to swim in the ocean, that we'd need to bring bathing suits. But I didn't see the ocean. Soon we were marching across the sand. The weight of the pack on my back was crushing, but I summoned all the strength I could find and followed the others, hiking up the dune. I could hardly complain, since everyone else seemed to be carrying more than I was. Several of the older guys were carrying large objects between them, in addition to their backpacks. We marched silently through the cool, cloudy night. The air smelled clean and fresh, and seemed like beach air, even though I neither saw nor heard the ocean. We hiked over one dune and up to another. With each step my pack grew heavier, and I felt I could go no farther; yet somehow with each passing step I found the strength to make the next. In reality, the hike was only about half a mile, but to a small boy new to backpacking, it seemed like a much larger distance. At last we arrived at the campsite. I found Peter, and we plopped down on the ground, exhausted. We talked briefly about our respective journeys, then glumly began wondering how we were going to set up our tent. I rummaged in my pack for my flashlight, and Peter opened up the tent bag and dumped the contents out on the ground. Then, suddenly, the cool darkness was dispelled by a glowing red light, of an emergency road flare. The sandy dunes were well illuminated by the burning glow of the flare. When a second and then a third flare were lit up, it seemed almost as bright as day. This was my first real introduction to the fact that the older guys had all this really neat stuff. 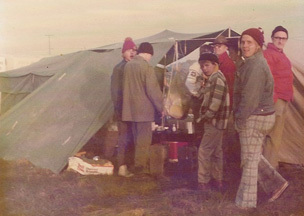 The idea of bringing flares for lighting would never ever have occurred to me; yet these other scouts, only a few years older than I, had not only thought of doing it but had actually accomplished it. And the really amazing thing about this, I thought, was the way they took all their neat stuff for granted. They were so cool, they thought nothing of the flares. Just a matter of fact attitude, "Let's break out the flares and get to work." While Peter and I were jumping around saying "Wow, look, they've got flares!" they were already hard at work setting up their tents. And it was always the case. In future camping trips I saw all kinds of other nifty things they had and did, about which they remained completely cool. I can remember one trip when we were camping deep in the forest, and Donny broke out a machete, a knife big enough to be a sword, and began hacking down weeds and vegetation with it in order to make room for his tent. On another trip, a backpacking trip in the dead of winter, David brought a small, battery-powered space heater. I had packed only the barest minimum of stuff, tossing out anything that seemed frivolous, and even so, my pack weighed so much it nearly killed me. Yet these guys brought all kinds of stuff they didn't need, making their packs incredibly heavy, and still they hiked along as if their packs were filled with cotton balls. With my almost empty pack and theirs jammed full, the hike was a Sunday stroll for them and a death march for me. 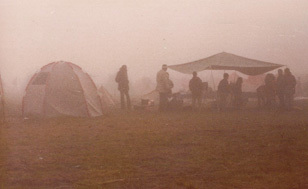 And at the end of the line, I sat shivering in my tent, while their tent had central heating. Even by flare light, Peter and I had a tough time setting up our tent, since we had never done so before, and we'd probably still be out there working at it if Donny had not come over to give us a hand and some instruction. It was very late by the time we got our tent set up and all of our stuff moved into it. Peter was about to fall asleep on the spot, and I wasn't much better off, but I had a hunch that the older guys wouldn't be turning in just yet and I didn't want to miss out on anything cool they might be up to. So I coaxed Peter into staying up and sneaking over to the older guys' campsite with me. Peter and I were sleeping in a pup tent, a very small two-poled tent, which officially slept two, but which was very cramped indeed with two young men and their two mountains of personal effects shoved inside. However, the older guys were using an enormous tent they called the "Monster Tent". 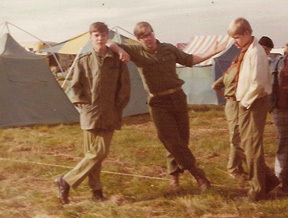 The monster tent was a vast, rectangular affair, which was apparently army surplus. Unlike our tent, you could easily stand up inside it, and though it officially slept eight, they had about ten guys and all of their stuff in there, and it was still quite spacious. We begged permission to enter, and when it was given, we crept inside. The older guys were all huddled together in a circle down at the far end of the monster tent, within a pool of light cast by a kerosene lantern. The tent seemed cavernously large as we moved through the dark front region towards the dimly lit back corner. There, the older guys were playing poker. They didn't let us play, but they did let us watch. They had actual chips, set out in big piles before them, and there was a hat in the center that they used as a pot. And they were all eating Slim Jims, those spicy beef by-product cylinders, and they left them hanging out of their mouths, eating them very slowly, treating them as if they were cigars. We sat for a long time on the outer fringe of the pool of light, watching them play and listening to their jokes and conversation. After awhile, Chris dug into his backpack and pulled out two magazines. Before I could clearly discern what these were, David grabbed them and shoved them back out of sight. "Get the kids out of here first, man," he said in a conspiratorial tone. Then Donny snapped his fingers and addressed Peter and me. "Time to go, guys," he announced. Reluctantly, we left. I vaguely recall stumbling through the darkness on the sand dunes for a long time before we finally found our tent. The morning air was cold and crisp as we awoke and crawled out of our tent. The big guys were already up, and they had built a big fire out on the sand in an open area between the campsites. They were cooking breakfast. According to our menu, Peter and I were scheduled to have hot chocolate and oatmeal for breakfast. But when we pulled on our clothes and wandered over to the fire, we saw that the big guys were fixing a huge banquet of pancakes and sausages and bacon and eggs and coffee. All we needed to cook our breakfast was boiling water, so we stuck a pot of water onto the edge of the fire, and sat down in the cool sand at the edge of the fire to wait for it to boil. The big guys were all bustling about, preparing for breakfast. Bruce and Donny were apparently in charge of the fire; Bruce disappeared into the forest and returned with an armload of firewood at intervals, and Donny tended the fire, poking it with a big stick and adding wood as needed. David and Todd seemed to be the actual cooks, and were arrayed with pots and pans and food supplies, and they hunkered down around the fire, cooking the food. David seemed more or less in control of the whole operation, if for no other reason than his hat; he wore a big white chef's hat on his head, the kind with the mushroom-like plume of puffed cloth. I heard Chris shout something from inside the monster tent, and I suddenly realized that not all of the older guys had woken up. I peered through a flap and saw that several bodies still lay wrapped up in sleeping bags within. Chris was the only one awake, but he wasn't ready to get out of bed yet, so he attempted to exercise some authority by shouting commands from his bed chambers. David shouted back that the food was almost ready, and that they should haul themselves out of bed if they wanted any breakfast. Peter pointed out that our hot water was boiling, so he and I fixed our own breakfast. It doesn't take long to eat a bowl of oatmeal, and we had finished eating even before Chris and the others, looking half dead, staggered out of the monster tent to eat. We weren't really very hungry anymore; the oatmeal had been a decent, if unexciting, breakfast. But we still longed for the kinds of food the older guys were eating. Fortunately, when the older guys had polished their plates and sat back with full smiles, there was still a fair amount of food in the serving pots. They had cooked so much food, it seemed, that they had cooked too much. Donny noticed that we were hungrily eyeing the leftovers. "Go on, knock yourselves out," he said. So Peter and I helped ourselves to crumbs from the floor of the gods, and they were gloriously tasty. After breakfast, the task of doing the dishes befell Tim and Jim and Chris, who had stayed in bed while the others worked. They went at this work without any complaints, even seeming cheerful about it. This struck me as odd, since doing dishes is always such drudgery, but I later realized that they all took turns at the various jobs, and that while they did the breakfast dishes, others would have to do the dinner dishes, so in fact it was good that they were getting this task out of the way early on. Peter and I hung around while they worked and learned how to wash dishes without a sink, and also managed to use their soapy water to clean our own breakfast dishes. As we finished up our dishes, I became dimly aware that other things were going on in the campsite. Over beyond the monster tent, up on the top of the dune, was a clump of other tents, where most of the rest of the troop was gathered. In the morning sunlight it became clear how and why everyone had pitched their tents where they did. At the scoutmaster's urging, most of the troop had set up camp at the top of the sand dune. The older guys, being more rebellious and privacy- oriented, had set up the monster tent some distance away from the rest of the troop, towards the edge of a clump of pine trees. And Peter and I, being the last to arrive, the most exhausted, and the least aware of the politics of tent placement, had stopped walking and collapsed on the ground as soon as we realized we were more or less at the campsite. Thus, our tent was halfway down the sand dune, relatively close to the monster tent, but a good distance away from the rest of the camp. Up in the main campsite, most of the troop was assembling to play a quick game of football. Football seemed to be one of the big items of interest in the adolescent age range of troop members, and this was encouraged by our scoutmaster, who always brought along a football, and often stirred up a game prior to the weekly scout meetings. Being camped so far away from the rest of the troop, I didn't see what they had done about breakfast. But I know from other trips that it was probably a mixture of simple meals like mine and Peter's, and experimental versions of the older guys' complex meal, almost certainly leaning towards the burnt and underdone incarnations. In any event, it seemed that they had all finished doing whatever it was they had done about breakfast, and were now becoming interested in the football game. Several of the older guys, sensing the impending game, ran up the hill to join in, and Peter ran along with them. I, however, declined to play. Partly this was due to a complete lack of interest in football games, but mostly it was because I was keen to find out what the rest of the older guys, the ones who had also chosen not to play football, were up to. As the football game got underway up on the top of the dune, Donny, Todd, and Jim all began walking down the sand dune towards the bottom. I followed them. They were all carrying shovels, of the cool fold up kind often found in use by both the Boys Scouts and the U.S. Army. We went down to the bottom of the dune, to the lowest point in the valley between dunes that they could find. Then they started to dig. I sat in the sand a short distance away, and watched as they dug. After awhile, I said "What are you digging for?" Donny said in a secretive whisper, "Buried Treasure!" then he and the others laughed. I sat silent for a moment, trying to figure out whether or not they were kidding. Then Todd said, "Actually, we're digging a well." "Just to see how far down we have to go before we hit water. See, we're only about a mile from the ocean, so we're just above sea level. That means the water table is real high, so we shouldn't have to dig down very far before we hit water." I lay back in the sand and lazed. Donny and Todd and Jim worked away at their hole, joking and goofing off the whole time. Way off in the distance I could hear the faint shouting of the rest of the troop as they played football. I felt very sleepy, and I think for a while I may have been asleep. But at some point I realized that the game up on the hill had ended, so I shook the sand off my back and went up the hill to find out what was happening next. As I left, I noticed that the welldiggers had dug down about two and a half feet. Up in the main campsite, people were starting to eat lunch. Peter and I had brought pre-made sandwiches from home, and this was what many of the other younger scouts had done. So Peter and I got out our lunches and sat down with the rest of the younger guys up on the top of the dune. A small fire was burning; it seemed that everyone who had not brought a bag lunch was cooking hot dogs on sharpened sticks over the fire. The scoutmaster brought out a big drink dispenser filled with red Kool-Aid and said we could all help ourselves to it. The peculiar thing about this was that everyone called this drink "Gumperts." I knew it was Kool-Aid; I had seen the empty packages that the scoutmaster had mixed it up from. Yet everyone called the drink Gumperts. Rather than look stupid, I didn't question this, but went along with the others in calling it Gumperts. And it wasn't until summer camp, almost a year later, that I came to understand why Kool-Aid had this nickname. Every summer, troops from all over spend a week at a big Boy Scout-owned campground called Goshen. There, all the menus and food for the whole week are worked out in advance and supplied for the whole group as part of the package price. An instant drink mix, very similar to Kool-Aid, accompanied every lunch at Goshen. It came in an orange and white box, and was called "Gumpert's Drink Mix". Somewhere along the line, the troop tradition evolved such that any Kool-Aidish sort of drink was called Gumperts. We sat on the dune eating our sandwiches and drinking Gumperts. The air was warm and the sky was dotted with small white clouds which drifted slowly across the horizon. The conversation among my fellow scouts wandered from one subject to another. I listened, but I usually didn't say much. Down near the monster tent, the older guys were hard at work on their own lunch. Unlike everyone else, they had chosen to undertake another full-scale cooking operation. But from where we were, I couldn't quite see what it was they were cooking. Further away, Todd and Jim were still digging their well; Donny had abandoned them to help out with the lunch preparations. In the afternoon, we went swimming in the ocean. As Todd had said, we were camped a mile or so inland. After lunch, we all put on our swimming suits and walked that mile out to the beach. The water was salty and very warm, and the waves seemed huge as they crashed on the beach. We swam for hours. After all the swimming and the hike back, everyone seemed tired, and almost everybody, myself included, took a long nap in the late afternoon. It was too hot in the tent, so I'd been sleeping out on the sandy dune. I awoke to shouts of delight. Todd and Jim were apparently more interested in digging their well than in the extra sack time, and now they were leaping around and screaming "We did it!" I wandered down the hill to see. They had indeed done it. Their hole was now about five feet deep, and at the bottom of the hole was a shallow pool of murky, blackish water. "We did it!" shouted Todd. I wandered back up the hill to see what else was going on. Almost everyone else had ignored the welldiggers' shouts of triumph and continued to sleep, but over at the monster tent, Donny and Bruce were already working on dinner. They were now the head cooks, and had quite an operation going. The fire had been stoked up earlier with big logs and then been allowed to die down. As I looked at it now, it was a wide bed of glowing hot coals, which was exactly what Bruce and Donny needed. Stuck here and there in the coals were a bunch of silver objects which I recognized as potatoes wrapped up in aluminum foil. On either side of the bed of coals, Donny and Bruce were each working on other parts of the meal. Donny was mixing up cornbread batter, which he was eventually going to bake in a cast iron device called a dutch oven. Bruce was loading charcoal briquettes into a portable grill which he told me was called a hibachi. Later, he would be grilling big, thick steaks on this hibachi. I glumly reflected on the menu that Peter and I had planned for dinner: macaroni and cheese. After a while, other people began waking up and starting to think about dinner. After Peter observed the gourmet meal that the older guys were working on, he and I silently agreed to do our cooking up on the main campfire, with the younger scouts. We did seem to be fairly unique among our own age group in what we were attempting to cook. 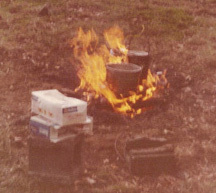 Most of the others were doing one of two things: Hobo dinners, in which hamburger meat and vegetables, like carrots, onions, and potatoes, were wrapped up in aluminum foil and slowly baked in the coals, and canned beef stew, which they warmed up either directly in the can or in cooking pots. Our own meal called for cooking macaroni noodles in boiling water until tender, draining off the water, and stirring in a packet of powdered cheese. We didn't think this would be all that hard. As the noodles cooked, we battled the heat of the flames and the annoyance of the smoke to stir the macaroni at intervals, and to remove a noodle or two every now and then to sample. Finally, after many tastes of crunchy noodle, Peter handed me one that I felt was ready. "It tastes done to me," I said. "OK," said Peter, "then I'll add the cheese." Almost immediately, Peter realized his mistake. He had dumped in the cheese powder before draining off the excess water. He howled, and together we waved our hands helplessly in the air, trying to think of a solution. We tried draining off some of the water, but this just took the now dissolved cheese powder with it. Then we decided to let it cook a while longer, to boil the water away. Ultimately, we had soupy macaroni with only a mildly cheesy taste, and also had to face a cleanup job which involved scraping a lot of burnt noodles out of the bottom of the saucepan. The sadness of our failure was lessened only by the failures that surrounded us. Larry and his cooking partner Steve had accidentally knocked over their can of Dinty Moore beef stew, and they had lost half of their dinner to the flames before righting the can. Also, many of the hobo dinner people had impatiently declared their suppers ready before they really were; this meant overly rare meat and dreadfully underdone potato for most of them. Naturally, all went very well for the older guys. We could see them, off down the hill, as they dug into their baked potatoes and gobbled up their steaks. After a bit, Donny wandered up the hill with a pan of cornbread. "This is up for grabs," he said. "We're all full." Peter and I and the others who'd had less than fulfilling dinners all dove for the cornbread. Boy, was it ever good. At around 6:00 PM, everybody began congregating down by the monster tent, pestering the older guys about something. I sensed that there was something that traditionally happened at this point in a camping trip, and I congregated along with the others. At last Bruce emerged from the monster tent with two semaphore flags. "All right!" he shouted. "Let's go play!" I asked Steve, one of the guys who had lost his beef stew to the fire, what we were going to play. "Capture the Flag," he said, "It's great." We wandered down the sand dune to the well. Bruce said, "Anybody not know the rules?" Peter and I raised our hands. So did Sam, a silent type I hadn't really learned much about. "OK," said Bruce, "What we do is we make two teams, and set up a playing field with two sides. The border between the two sides will be clearly defined. Each team hides their flag somewhere within their territory, and also declares a location for their jail. "The object is for someone from your team to sneak into the enemy territory, find the flag, grab it, and get back into your own territory without being tagged by someone from the other team. If you get tagged, you have to sit in the jail until someone from your team tags the jail and lets you out. Whichever team gets the other team's flag first wins. Any questions?" In all my days as a kid I had never played a game quite like this. Games and sports that had defined rules were always boring and foolish stuff like baseball, football, and kickball, all the stupid games you had to play in physical education class. Games we played on our own were always far less structured things, like cops and robbers and cowboys and Indians and that sort of thing. But this game was great; it combined the fun and imagination of sneaking around and hiding and fighting the enemy, yet it also had a definite goal and a clear winner. The playing area was huge, ranging over two whole sand dunes. The valley between the dunes was the border, the well being one of the border markings. When we first started playing, the game was mostly a matter of speed and daring; but as the evening wore on and the sun went down, stealth and tactics won the day. I somehow fell into a sort of partnership with David; I realized later that he was willing to work with me because in a conflict he could outrun me, leaving me to get caught and go to jail, and him free to continue the fight. But it did mean that we snuck around together, and I drew upon his experience in trying various things. Our whole team met at the beginning of the game to discuss strategy, but this was all soon forgotten as each man or small group worked individually. David and I crept through a row of pine trees along the edge of the dunes, and snuck right into enemy lines. We stayed just inside the treeline, and got pretty far into the enemy territory without detection; but we couldn't find the flag. Then Donny, who was on the other team, spotted us, and came dashing towards our hiding place. Dave took off running, across the dune, down the hill, and back to safety, leaving me to save myself. I ran as fast as I could, but was no match for Donny, and soon found myself in jail. 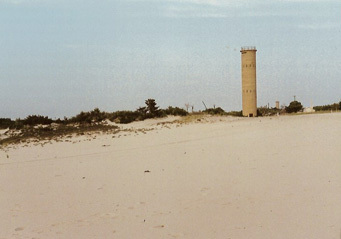 Jail was a spot at the top of their sand dune, which they had marked with a large cooking pot. I watched the game unfold, wishing for rescue, but also scanning the territory for some sign of their flag. It became clear that wherever they'd hidden it, it was out of sight of the jail. After a while, a couple of other people from my team were caught, and I heard that we had also captured several of their players. Then at long last, David came charging up the hill to the jail. He was going to let us out! He was taking a chance because their guard was down and our team needed more people to defend our own territory. He tagged the jail and we all scattered, rushing back down the hill towards freedom. But as I ran, I became aware of something awful; Donny was across the border, in our territory, and was rushing down the dune, with our flag in his hand, and Todd and Bruce and Peter (of all people) in hot pursuit. But they couldn't touch him; Donny had long legs and was across the border in a flash. The game was over just as I was about to get back into the action. They had won. But I didn't really care; I had still had a great time. While we'd been playing capture the flag, the scoutmaster had hung around the campfire. He'd kept the fire slowly burning, adding an occasional stick of wood, and over the fire he'd been brewing a big pot of coffee. When twilight became darkness and our game finally ended, we all crowded around the fireside. The big guys swarmed around the woodpile and built the fire up to a roaring blaze. An additional pot, this one filled just with water for hot chocolate, was hung over the flames. Now began the ritual of the cracker barrel. The big guys dug once again into their cornucopia of food, and brought out cheese and crackers and candy bars. Naturally, Peter and I were unprepared for this unexpected meal, and naturally the older guys shared with us. They had several bags of those "miniature" size candy bars, as well as some big bags of M&M's, and they had cans of that soft pressurized cheese which you squirted out of a nozzle, not unlike whipped cream. All of these treats were passed around from person to person as we sat on big logs surrounding the roaring campfire. Then the Scoutmaster brought out two bags of marshmallows, and we all dove into the woods to search for sticks, which we sharpened, stabbed through marshmallows, and stuck out into the fire for roasting. And when the pot of water began to boil, we mixed up hot chocolate, though many of the older guys were already drinking coffee. Then it was time for entertainment. We sang songs and told jokes, and the scoutmaster told a pretty creepy ghost story. Then the big guys all caucused and came up with a skit to put on. In it, about half of the guys assembled in formation and pretended to be the crew of a British warship. The lookout (who was riding on another guy's shoulders) said "Captain! Three Spanish Scallions off the port bow!" The Captain said "Prepare to engage in battle! Gunners, man your weapons! First Officer, bring me my red jacket!" The First Officer brought forth a bright red jacket, which the Captain then put on. And suddenly, the rest of the older guys burst out of the woods, and the British ship was attacked by the Spanish Scallions. After a bit, the Spanish guys, having been defeated, ran off. Then the Captain proclaimed, "We have been victorious! First Officer, put away my red jacket." This procedure was repeated several times. Each time, when the Spanish were sighted, the Captain put on his red jacket, and when the Spanish were finally driven off, he removed it. At last one of the younger sailors asked the First Officer why the Captain did this. "Because," said the First Officer, "the Captain is afraid that if he is wounded, the crew will lose heart, and become demoralized. He wears the red jacket in battle, so that the crew won't see the blood if he gets wounded." Just then, the lookout cried "Captain! It's the entire Spanish Armada!" "Oh, no!" shouted the Captain. "First Officer, bring me my brown pants!" As I recall, the older guys played poker again that night, but I was very tired, and went to bed early. I slept very soundly. However, I woke up miserably. There is nothing quite as cold and dreary as waking up in a tent in the rain, especially when that tent hasn't completely done its job of keeping out the water. One wakes up slowly, gradually becoming conscious, gradually realizing that he is not in his usual bed but in some foreign place of sleeping. Then, with sudden and horrible astonishment, he realizes that he is cold and very soggy, that his left leg is lying in a pool of icy water, that rain is dripping into his face, and that the constant thrumming noise in the background is in fact big drops of rain water pounding, pounding, pounding on the thin sheet of canvas that masquerades as a shelter. "Aw, man!" I groaned, "It rained! It's raining!" Peter had been only half awake and had not yet figured out the reason for his discomfort. Now he understood, and wailed. There's no place to hide when it rains and you are camping. There's no house you can run back to, no street corner shop you can duck inside of, no highway overpass you can wait out the storm under. If your tent has holes or falls over or the window was left open or whatever, and water gets in, then that's it, you have no choice but to endure being wet. And Peter and I were soaked. We crawled around inside our tent, pulling on our soggy clothes and bemoaning our fate. Things looked more and more bleak as we took stock of our situation. Everything we had was drenched. There was a two inch deep pool of water in the center of our tent, and all of our equipment was, to a greater or lesser degree, soggy. We put on our ponchos, those stupid flimsy plastic rainwear things that are standard issue for Boy Scouts, and crawled outside. Somehow, it seemed dryer outside than in. The rain was coming down steadily; it was one of those slow, constant rains that go on and on with a consistent downpour that never seems to ease up. We hurried over to the monster tent. The monster tent was also taking on water, but its sheer colossal size kept its integrity as a shelter intact. We pushed our faces through the doorflap, and saw that a large pool of water had collected in the front section, but that the back seemed fairly dry. The older guys were all up and around, and were piling up their stuff in the dry zone to keep it from getting any wetter. Peter and I were very despondent. Far from merely dampening our spirits, the rain had actually washed them away completely. But I saw that this was not the case with the older guys. They were soggy, too, but they still seemed to be having fun. They were pushing each other around, and making jokes, and laughing, just like always. I couldn't understand this. Donny came toward us to grab some stuff out of the front corner. "Hey, come on, Android," he said, "It's just a little rain!" I tried to force a smile. One thing was clear, however. We were leaving as soon as possible. The older guys were already packing up their stuff, and it looked like we were just going to skip breakfast and head for home. This sounded just fine to me. Peter and I dismally packed up our stuff. We wrung out our clothes and sleeping bags, and packed it all together as tightly as possible, but our stuff had increased several times in volume. This was of course true of everyone in the troop, and as it turned out, we all had to make two trips to get our stuff back to the cars. It took three of the big guys just to carry the waterlogged monster tent back. On the way home, I had an actual seat, though in a different car, and I spent most of the trip sleeping. And when I was finally dropped off back at my house, the rain had stopped. My mom helped me hang up my wet clothes, the tent, and my sleeping bag, on clotheslines in the basement, so that they could dry. Then I enjoyed a long, hot bath, which made me feel good for the first time that whole day. That evening we went out for dinner, and I told my parents about all the things we had done. After that, I did my homework.